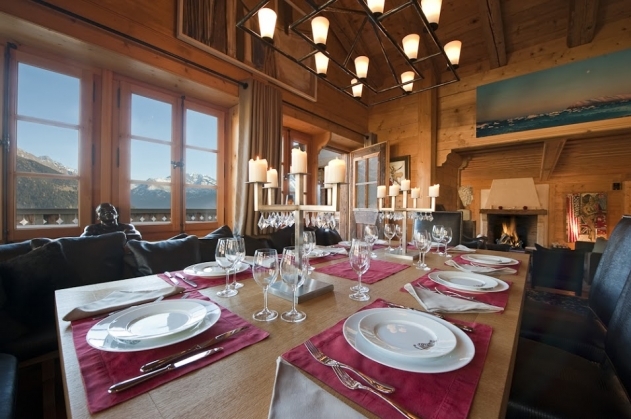 A lavish five-bedroom chalet, Daria perches high above Patier and boasts jaw-dropping panoramic views of the surrounding peaks and ski mountain. Constructed using old woods and natural stone, this exclusive mountain retreat is divided into two separate buildings, a main chalet and smaller Mazot. 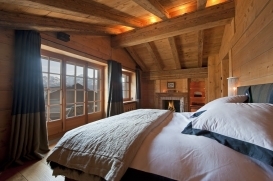 It sleeps up to eight adults and six children and has five distinctly stylised en-suite bedrooms. Daria tastefully blends contemporary luxurious living with a refined interior, housing carefully selected pieces of art, modern and antique furniture, and classical objects d'art. 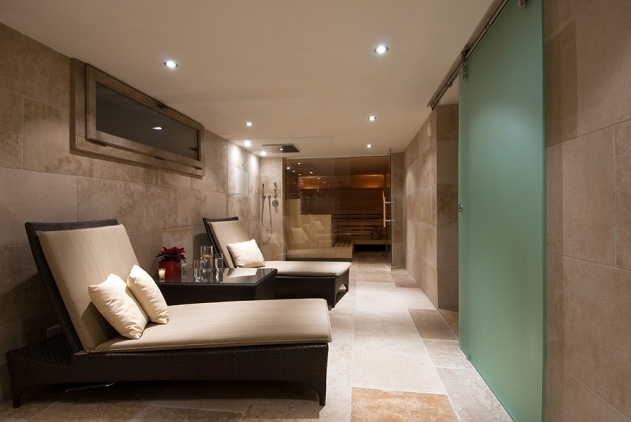 Its facilities include a dedicated spa with a Hammam and massage area, a cinema, and an impressive wine cellar. 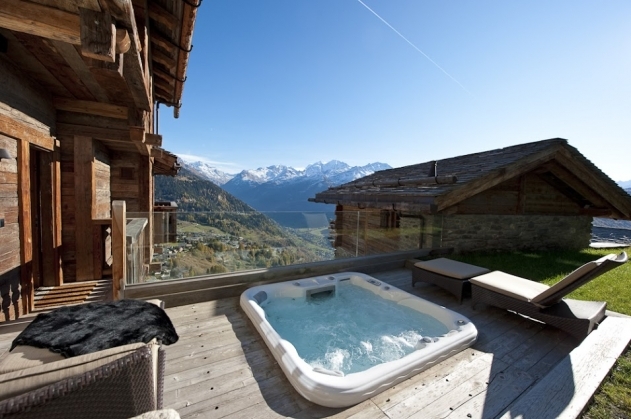 The discreetly located outdoor hot tub is ideally situated to take in the splendour of the panoramic mountains. Each of the five en-suite bedrooms is decorated with a unique colour scheme, antique rugs, and beautiful curtains. A bright and stylish hallway at ground level divides the south-facing property into two. The west wing or ‘Mazot’ houses a secluded upstairs bedroom with its own private balcony and en-suite bathroom, and enjoys exclusive use of a separate living and dining area. The Mazot also has a kitchenette and further separate shower room. The main chalet houses four bedrooms, the living areas, and the spa. This is set out over five floors. 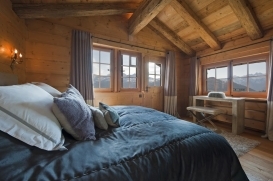 The top floor of the main chalet is given over entirely to the master bedroom which has a private balcony and an en-suite bathroom with shower and bath. The opulent open plan living and dining areas on the main floor features sophisticated décor, a stone fireplace, and a wrap-around balcony providing comfortable and stylish lounging. 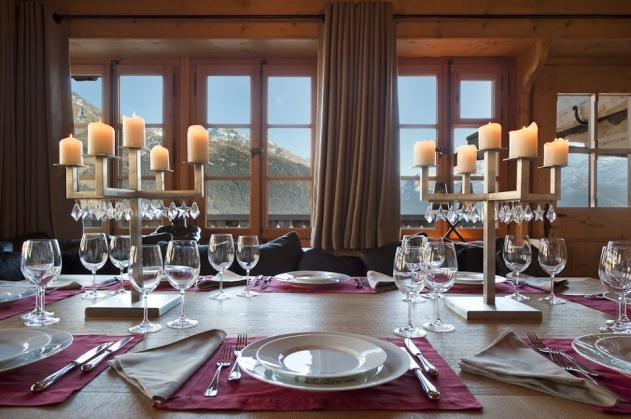 The dining table seats up to 14. The well-equipped open plan kitchen looks onto the dining room. This floor also boasts a private study. 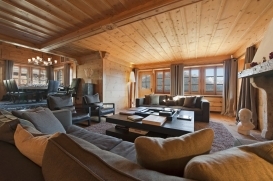 From the living room you access the outdoor hot tub which is situated between the Mazot and the main chalet. 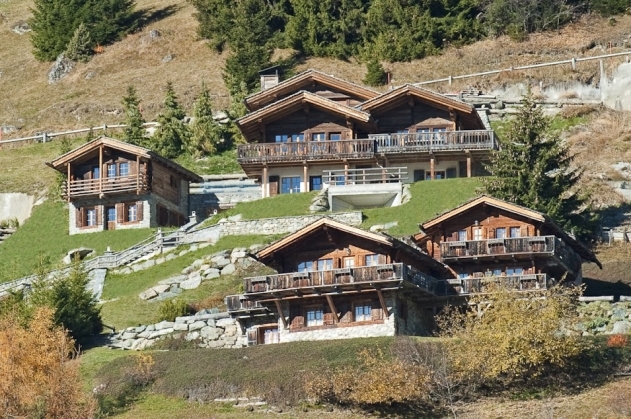 From here, enjoy a glass of champagne under the night sky with Verbier and the villages of the valley lit up beneath you. The main sleeping floor is located on the next floor down. 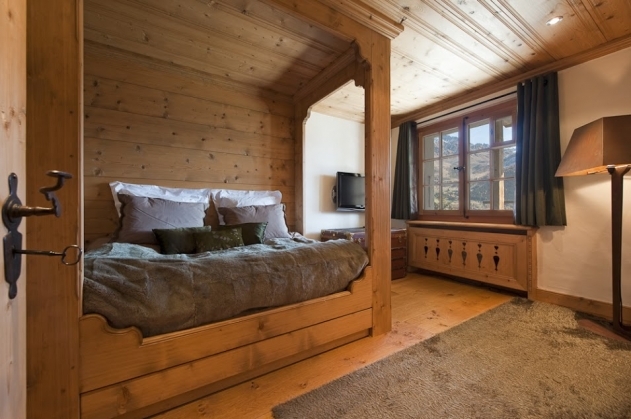 This floor consists of the six-bed children’s bunk room with flat screen TV and an en-suite bathroom with two showers. Two additional double bedrooms (one super king bedroom and a double bedroom), both with en-suites, complete the sleeping space on this floor. These bedrooms access a terrace area in front of the chalet. 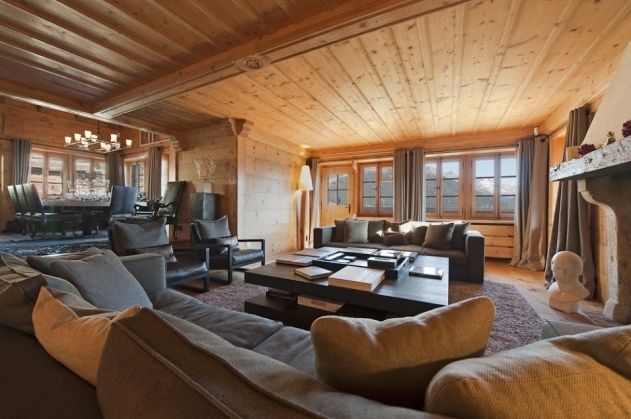 On the lower ground floor is the cinema room with a generous two by three metre screen, a stunning wine cellar which holds a decadent selection of old and new wines (available for purchase), and a devoted spa area with sauna, shower, and massage area providing all the amenities required after an energetic day on the slopes. 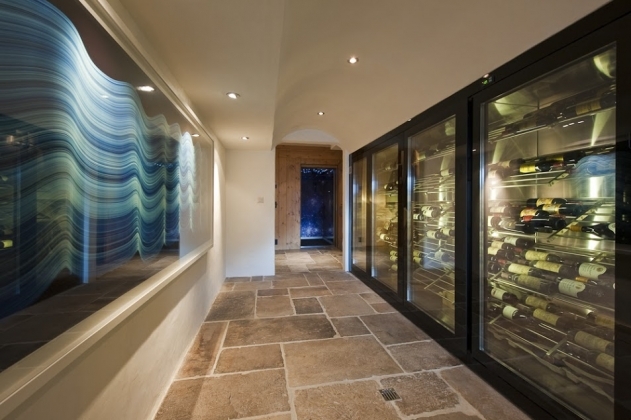 The private underground garage accommodating four vehicles is below this floor, built into the side of the mountain. 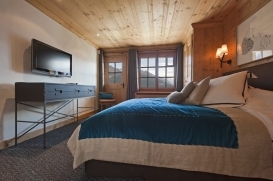 The house is wired throughout with a modern high-tech Crestron system that offers music, Sky TV, and Apple TV in two of the bedrooms. 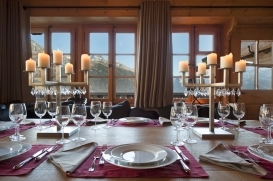 The chalet is normally provided with a dedicated driver service when sold on a full service catered basis. The chalet is sold on a catered basis only.